Your First Visitwhat to expect? Our modern dental practice is equipped with the latest technology and equipment to create a clean, safe, comfortable environment for all patients. Patients can rest assured that our dentists use the best equipment and the highest standards of care. Ready to start a lifetime of healthy smiles? Contact us to make an appointment with our expert dental team today! Providing Dental services to West Ryde and Surrounding Suburbs including: Denistone, Denistone East, Melrose Park, Meadow Bank, Ermington, Putney, Ryde, West Ryde, North Ryde, Eastwood, Marsfield and greater Sydney. Our qualified team of dentists are committed above all else, to patient satisfaction. We offer treatments that are designed to treat the patient as a whole, not just treat the problem at hand. This ensures no problem is left uncovered and helps patients achieve optimum health, appearance and wellbeing. We offer a complete range of General, Preventive, Cosmetic and Restorative dental care. 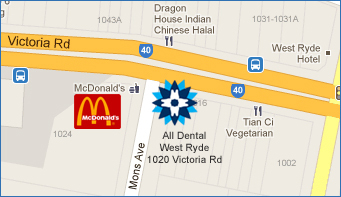 Copyright © 2012 All Dental West Ryde. All Rights Reserved.